Nosocomial infection (also referred to as HAIs) is a major problem in many healthcare facilities, with approximately 1 in 25 patients acquiring an infection during a hospital stay. * Studies have demonstrated that nearly everything in the healthcare setting – surfaces, airborne particles, healthcare workers’ hands, medical equipment and everything in between can serve as a reservoir and a vector for opportunistic pathogenic organisms. While poor hand hygiene and surface contaminations are the primary modes of transmission, pathogens can also be transmitted via air and water supply systems. Common pathogens found on cooling coils in air handlers are aspergillus and pseudomonas aeruginosa, which can break loose into the moving air stream through the hospital ducts. In addition, various viruses, bacteria and fungi such as tuberculosis, influenza, pneumoniae, acinetobacter baumannii etc. may be brought into the air stream from contaminated outside air or recirculated air from infected spaces. Waterborne pathogens found commonly in cooling towers and water supplies include legionella, cryptosporidium, mycobacteria, giardia etc. Numerous studies have now shown that environmental surfaces and inanimate objects inside patient rooms can contribute towards transmission of multiple drug resistant pathogens (MDROs) implicated in nosocomial infections such a MRSA, C-diff, Acinetobacter baumannii, CRKP, VRE and norovirus. The persistence of these bacteria and viruses on inanimate objects and surfaces can last for days, weeks and months. Ultraviolet germicidal irradiation (UVGI) has been as a supplement to mechanical ventilation to inactivate airborne infectious agents to protect the health of building occupants for many decades. Approximately 60% of all UVGI air disinfection systems are installed in health care facilities. More recently, the use of mobile UV equipment have gained popularity for terminal cleaning of patient rooms, isolation rooms and operating rooms as an adjunct to manual cleaning with chemical disinfectants. Ultraviolet germicidal irradiation is a practical and cost-effective method of inactivating airborne viruses, mycoplasma, bacteria, and fungi on clean surfaces. All viruses and almost all bacteria (excluding spores) are vulnerable to moderate levels of UVGI exposure, but the magnitude of the effect is extremely species-dependent. As the use of UVGI has become more prevalent, applying the technology has tended to be thought of as one application, that is, one size fits all. However, there are three quite different types of applications, each of them requiring a completely different approach and amount of ultraviolet energy. 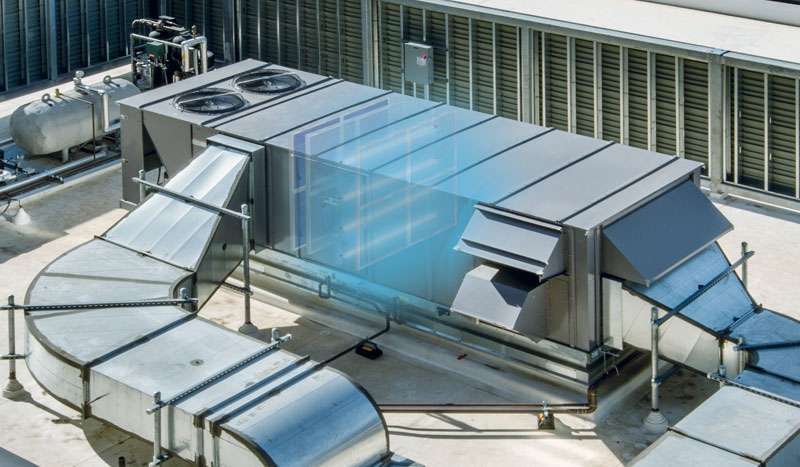 A/C systems provide an excellent setting for surfaces that support the growth of bacteria and mold in and around cooling coils, drain pans, plenum walls and air filters. The effectiveness of ultraviolet germicidal irradiation (UVGI) lights in elimination of microbial contamination to improve indoor air quality has been well documented. In these applications where the coil surfaces are irradiated 24/7, high UV intensities are not required and it is more important to fully bathe these surfaces and components in ultraviolet light. CDC guidelines for Environmental Infection control in Health-Care Facilities recommend the use of UVGI as a supplemental air cleaning measure to reduce the transmission of airborne bacterial and viral infections in hospitals, military housing and classrooms. Two systems of UVGI can be used for this purpose: duct irradiation and upper-room air irradiation. Duct Irradiation: In duct irradiation systems, UV lamps are placed inside air handler ducts that disinfect the outside air or recirculated air from inside the building. For disinfecting moving air, higher intensity ultraviolet is required due to the short residence time. In general, airborne virus and bacteria are relatively small (usually less than 1 micron), and therefore difficult to filter and yet relatively easy to disinfect with ultraviolet. Upper Air irradiation: In upper-room air irradiation, UVGI lamps are generally mounted above the occupant’s level (typically above 8 feet) and designed to irradiate the upper air in a room through convective air currents within the room. The bottom of the lamp is shielded to direct the radiation upward but not downward to prevent UV exposure to room occupants. Upper-room air UVGI irradiation has been used to inactivate tubercle bacilli in in TB wards. It may also be used in isolation or treatment rooms, waiting rooms, emergency rooms, corridors and other central areas of a facility where patients with undiagnosed infections could potentially contaminate the air. Environmental surfaces play an important role in transmission of healthcare-associated pathogens. Numerous studies have demonstrated that environmental cleaning is often suboptimal in healthcare facilities due to a variety of factors. 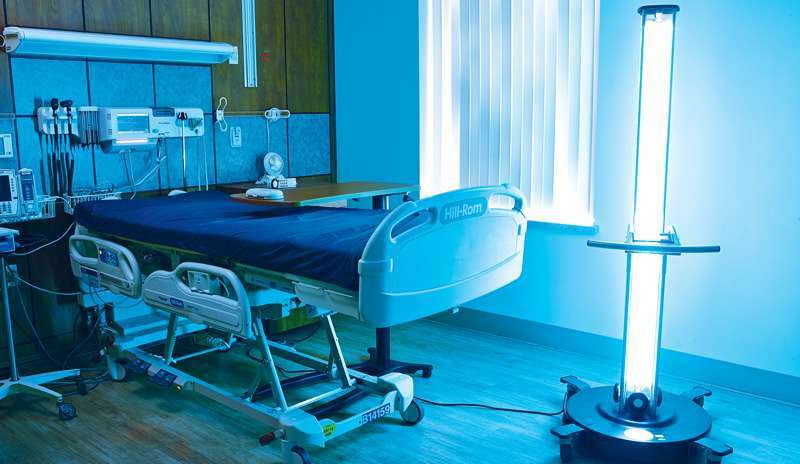 The use of automated “no-touch” portable ultraviolet UV-C devices for room decontamination is becoming popular to dramatically reduce the bio-burden on high touch surfaces in acute care hospital rooms, resulting in reduction in HAI rates. Typically, terminal cleaning in a patient room using these portable UV devices involves conventional cleaning of all surfaces using chemical disinfectant wipes followed by UV treatment cycles depending on the room size and layout. 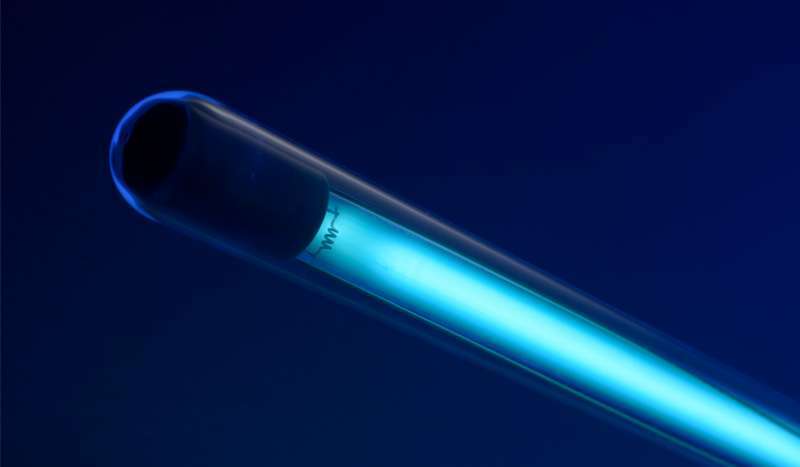 It is important to note that UV-C light is a “line of sight” technology, implying that the destruction of microorganisms can be achieved when they are in a direct line of sight of the UV device. 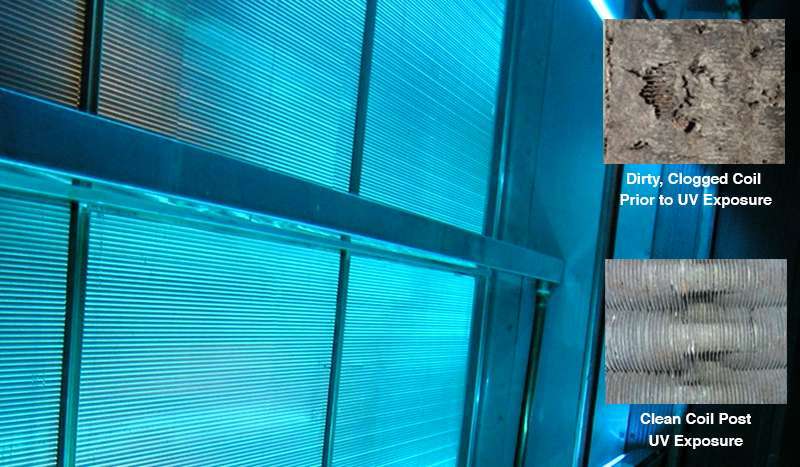 All common touch surfaces should be exposed to UV in order to accomplish the full destruction. This may require more than one placement of the UV device in an area with any hard to reach surfaces. Distance between the UVGI lamp(s) and the pathogen: The distance between the UV device and target surface is an extremely important factor. Studies have shown that dosage decreases by approximately the square of the distance from the lamp. Based on this formula, dosage at a distance of one inch away from the UV lamp is reduced to one-fourth at two inches away and so on. Intensity of the UVGI lamps: The intensity of UVGI lamps can vary significantly from one product to another, based on the sizes (length and diameter), designs, construction, and quality of the lamps. Duration of exposure to the UVGI lamp(s): There is a direct correlation between time and dosage. If all other factors are equal, a pathogen exposed for one second will receive double the dosage of a pathogen compared to a pathogen exposed for half a second. Device Design: Total output is a function of device design, number of lamps, height of the lamp, lamp configuration on device, reflectivity components on device etc. Studies have revealed that all of these objects and medical equipment potentially serve as a reservoir and vector for transmission of the various multidrug resistant microorganisms thus contributing to increasing HAI rates. This has prompted the introduction of several UV devices in various form factors to disinfect medical equipment such as wheelchairs, IV poles, stethoscopes, keyboards and smart devices such as phones, tablets, pagers and other communication devices. Kowalski, W.J (2012). Hospital airborne Infection Control. CRC Press, Boca Raton, Florida. Memarzadeh F, Olmsted R.N and Bartley J.M (2010). “Applications of ultraviolet germicidal irradiation disinfection in health care facilities: Effective adjunct, but not stand-alone technology.” American Journal of Infection Control, 38 No. 5 Supplement 1. Kujundzic E, Hernandez M. and Miller S.L (2007). Ultraviolet germicidal irradiation inactivation f airborne fungal spores and bacteria in upper-room air and HVAC in-duct configurations. Journal of Environmental Engineering Science pp 1-9. Miller S.L, Fennelly M, Hernandez M and Martyny J (2002). Efficacy of ultraviolet irradiation in controlling spread of tuberculosis. Final Report CDC/NIOSH 200-97-2602. First M.W, Nardell E.A, Chaisson W and Riley R (1999). Guidelines for the application of upper-room ultraviolet germicidal irradiation for preventing transmission of airborne contagion – Part I: Basic Principles. ASHRAE Transactions 105 (1): 869-876. First M.W, Nardell E.A, Chaisson W and Riley R (1999). Guidelines for the application of upper-room ultraviolet germicidal irradiation for preventing transmission of airborne contagion – Part II: Design and operational guidance. ASHRAE Journal 105:869–876. Otter J.A, Yezli S, French G.L (2011). The role played by contaminated surfaces in the transmission of nosocomial pathogens. Infect Control Hosp Epidemiol;32:687-99. BoyceM (2016). Modern technologies for improving cleaning and disinfection of environmental surfaces in hospitals. Antimicrobial Resistance and Infection Control 5:10. Weber D.J et al . (2017). Effectiveness of ultraviolet devices and hydrogen peroxide systems for terminal room decontamination: Focus on clinical trials Am J Infect Control 44 (2016) e77-e84. Pegues D.A, Han J, Gilmar C, McDonell B, Gaynes S (2016). Impact of Ultraviolet Germicidal Irradiation for No-Touch Terminal Room Disinfection on Clostridium difficile Infection Incidence Among Hematology-Oncology Patients. Infect Control Hosp Epidemiol p 1–6.